Spring football practice at Dayton ended with a scrimmage where the two Flyers from Solon fared well. Linebacker Ryan Schwenke had a sack & WR Cory Stuart had a TD reception. 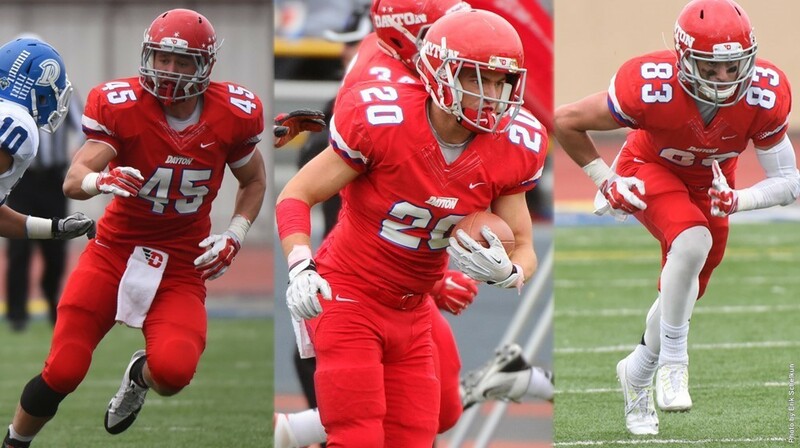 DAYTON – University of Dayton head football coach Rick Chamberlin has announced that linebacker Christopher Beaschler, safety Danny Leach and receiver Cory Stuart have been selected team captains for the upcoming 2015 season. The three seniors combined for 28 starts and were all named First Team Academic Pioneer Football League last season. About a dozen days until Dayton football opens fall camp. Summer working out will change to a highly organized days of work & meetings for Senior Flyers Ryan Schwenke & Cory Stuart. Ryan was one of the seniors who wrote a motivational letter to teammates. Of course Cory is a tri-Captain. So you can see that these former Comets are providing leadership for this team. With no title since 2010, this heavily laden senior group want to upset the Coaches Poll where San Diego is favored to repeat, Dayton 2nd & Drake 3rd. 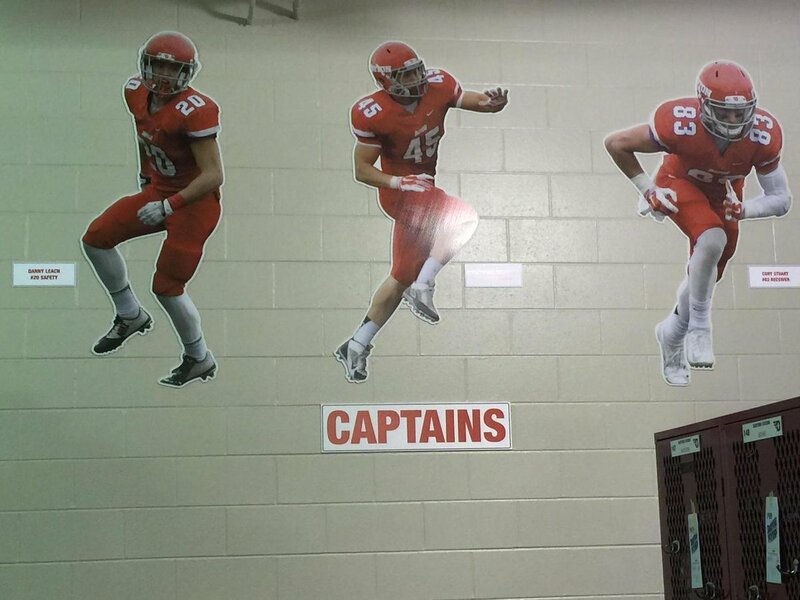 #83 Cory Stuart & the other Captains are up on the locker room wall at the University of Dayton awaiting the team reporting on Monday! Former Comet & UD Senior Cory Stuart, & other Captains lead Senior Ryan Schwenke and the Dayton Flyers in their first 2015 warmup at Welcome Stadium. They are picked for second place in the Coaches Poll but have worked hard on the mental as well as physical preparedness to do one better than the poll. Today was a single practice in the afternoon, although one of our hottest practcies in recent memory. Today was the first day of our practice rotations. In Rotation A we divide the team into 3 different segments. The OL, RBs & TEs compete against the DL, LBs and Safetys in our Inside Run Drill. The Wide Receivers compete in a 2 on 2 circuit against our CBs and Safetys. The QBs, WRs and TEs compete against the DBs and LBs in a Line Perimeter drill. We divide up our positions so we can get maximum reps. In Rotation B our OL and DL compete in a 1 on 1 Pass Rush Drill. The RBs and TEs compete against the LBs in a 1 on 1 circuit. Finally the QBs, WRs, TEs and RBs compete against the DBs and LBs in Perimeter. Finally, in Rotation C we divide half the offense and half the defense into two ends of the field. On one end we feature a scrimmage that focuses on Run Plays the other end we feature a scrimmage that focuses on Pass Plays. Some Highlights from the day. DL Michael Gray reeked havoc in both Rotation A, as well as caused major pressure for our QBs in Rotation C. DB Ryan Schwenke forced a fumble in Rotation A, and DT Austen Alber had the recovery. OL Patrick Nuzzolese stood out today during our 1 on 1s, being an unstoppable force, as freshman WR JP Forcucci continued his strong camp performance hauling many impressive grabs. In Rotation C, Freshman QB Kyle Kaparos hooked up with WR Thomas Vogele for a long touchdown throw, as well as WR Cory Stuart had an outstanding day himself, catching hard catch after hard catch all afternoon. On Defense, freshman LB Luke Fulton continued to show great promise at the OLB position. With these Rotations we are able to get a lot of reps and a lot of film to learn from. Our players are getting better every day and are looking forward to the start of the second week of camp. Tomorrow will be our first double day practice where the entire team practices in the morning and comes back later for a practice in the afternoon. Go Flyers! Schwenke and Stuart, possibly a few more Comet players being offered to go to Dayton, (probably two) but next season and the one following Solon will have more that can play out there. The 107th season of football for the University of Dayton begins Sat. at noon in PA when the Flyers visit Robert Morris. Two ex-Comets are in the game notes. 83...CORY STUART 6�1, 200, RS SO.�Captain; Third on the team with 35 catches for 10.9 avg. There were a lot of first-time starters for both teams Saturday & the 1st qtr looked it. But Dayton figured it out and laid the 16th loss in 18 games against the RMU bunch. Dayton's leadership by 3 co-captains was the difference. Safety Danny Leach had 2-int (i for a 93 yd TD), a forced fumble & 4 tackles. Here's how the game ended. UD had a 3-point lead & RMU was driving but w/o timeouts. They did some dumb things like not step out after a catch & not throwing ball away before getting sacked. But RMU connects on a 32 yd pass to UD 28 yard line. Clock stops to set stakes but only 2 seconds remain. Spike it right? Wrong? Whole UD sideline is hollering "they can't spike". Ref tells QB "he can't spike". So center has to snap, QB has to drop back, but receivers stand expecting a spike but all they see is another sack! Coach has demonstrative argument after game. RMU webcast announcer doesn't understand why the refs said that! In 2013 the NCAA rules changes in addition to that spearing and your out of the game rule, you can no longer spike a ball when clock starts with less than 3 seconds! OMG - Dayton players even know the rules! Catching Up on All the Wins! After RMU, Dayton hosted Duquesne, always a big physical team. Dayton's offense started with All-American RB Connor Kacsor who carried 44 times for 246 yards. Cory Stuart had a pass reception & Ryan Schwenke had 5 tackles. Flyers win 24-13. If you're counting that's 5-0 for the Flyer season. Attached are photos of Stuart's TD catch & his excellent blocking & Schwenke with action against San Diego. This should be the 6th post of a win...it was 14-14 in Valparaiso, IN until the Flyer defense said enough is enough. Post game the Receiver Coach said this is the best practice team he ever worked with; and that a quiet guy, Captain Cory Stuart has taken a leadership role. Seems it applies also to halftime adjustments too. UD went for 30 unanswered points for a 44-14 win. It was Daytons 99th win in the PFL, the most by anybody! Ryan Schwenke, the CB, had a funny game. He had no stats. Oh, except he had 2 fumble recoveries - one he ran 35 yds into the end zone for a TD & the other he ran 36 yds but a Valpo receiver caught him inside the 10. Cory Stuart had 4 receptions for 39 yds making it 21 games in a row with at least one reception for Capt. Cory!. Everybody on the bus got to play at least 3 snaps. The visiting crowd was the largest for Valpo's season as the UD friends & families from the heavily recruited Chicago & Indiana area came out for the win! Longtime nearby rival Butler rides their bus from Indianapolis to Welcome Stadium next Saturday evening! Go Flyers! Get them Bulldogs! For nearly 53 minutes last evening the Butler Bulldogs had a lead on the Dayton Flyers but it's after 60 minutes that counts! Cory Stuart had 8 receptions for 70 yards. This was the Captain's 20th consecutive game with a catch! Ryan Schwenke was credited with two tackles & I think both were for losses. Now 4-0 in the Pioneer League, the only team with a perfect record, they host the Jacksonville team next Saturday, always fast & tough bunch. Of course they cheat too with scholarship money so the Florida team is not eligible for NCAA consideration this season. It's an amazing ride this year for Dayton with nearly all games won in second half when they begin to show strength on both offense & defense. Credit goes to the hard work so many did this past summer, many staying on campus to work with the strength & conditioning coach. That school has all of the latest workout equipment in a facility second to none. These guys got or presently are getting a great education (the purpose of college) & their football league acknowledges the success on the field & in their classroom. If you or your son want to continue education & football & are not big enough or fast enough for the Big Programs, take a look at this link about the program that since 2000 has the fourth best winning percentage (.738, 124-41) in all of FCS football!!! Those Flyers are perfect 8-0 with a 31-14 win over that usually speedy team from Jacksonville University. This year there was enough UD defense to slow them down. Former Comet Cory Stuart had 5 receptions for 62 yards. It was his 21st consecutive game with a catch. Ryan Schwenke was credited with 6 tackles that helped shut down the Dolphins running attack. Next week it's a trip down to Kentucky for Morehead State, a 2nd place team in the PFL. Quite a season these former Comets get to play at UD. This week the bus ride home from Kentucky will be joyful with a 20-15 win over 2nd place Morehead State. The Eagles QB threw for 323 yards but Dayton intercepted 3 times & yielded no turnovers to Morehead. Leading receiver for UD was Cory Stuart with 8 catches for 74 yards. Ryan Schwenke had 6 tackles for the stingy defense. So with a 5-0 PFL record the Flyers will play their last home game next week against Marist from Upstate NY. Senior Day at Welcome Stadium & a chance with two remaining games to be the first Dayton team to be in the FCS Playoffs. But they only win one at a time so Saturday is just another important game. Go Flyers! A championship can be won & a final home game for Seniors on the Dayton Flyer team Saturday. Nice opportunity to see some former Comets before heading to the playoff game of the "current Comets". Word from the Marist fans in Poughkeepsie is that Time Warner Sports will carry the game on TV in Upstate NY & in Ohio. if that's the case, many can pick it up beginning at 1:00om on TV. Congrats to the Dayton Flyers, PFL Champions & FCS Playoff bound after a nail-biting come from behind 28-21 win over Marist on Senior Day. Marist had 300 yards passing but were intercepted 3 times. Dayton had 74 yards passing but ran for 294. Capt. Cory Stuart caught 3 passes for 23 yards & Ryan Schwenke was leading tackler with 11 (8 solo). Next week they fly to DesMoines for the final game against Drake. Then it will be order their rings & get ready for the first Div.1 playoof in Dayton history. Must be fun playing on a team that is 10-0!!! When the Flyers stepped off their charter flight & onto the stadium famous for the Drake Relays in hog-heaven Des Moines, IA, their minds must have been on playoffs because they stunk the place out the first half. Imagine a 10-0 team playing a lesser team & having 49 yards of offense (the final play was for 18 yds) at halftime. They made a game of it with more focus for a while later ending with a 17-27 loss. All week the internet, campus & probably some classrooms were in "bracketology" what with the FCS playoff guarantee for the team. Very hard to put that aside for a few hours of your final schedule. Cory Stuart had 6 receptions for 31 yds ( you do the math). Ryan Schwenke had one of his better games with 11 tackles but had some trouble deep. That's a lot of tackles playing behind the linemen. All is forgotten this morning when the NCAA announced that Dayton will host Western Illinois at Welcome Stadium (location is via cash bid to NCAA) on Saturday at noon or 1pm??? Good Luck Flyers. Beat those Leathernecks! Watch on ESPN3. Interesting that Cory & Ryan will not be the only former Comets on the field for that FCS Playoff. Their former teammate Kyle Hammonds is a Senior Leatherneck. This smallish Comet star is not much larger today. He gets in all games at DB but probably not very long because he has few stats. But shouldn't this be some kind of Solon history with three former Comet teammates on the field in a playoff game??? After 10 years of playing & coaching football at UD, Kevin McCoy is leaving for a career change. He's coached several positions & worked coordinating recruiting. With football success for Dayton, you know we've always had some good coaching & recruiting. Good Luck to former Solon Comet & now former Flyer Coach McCoy. You may want to check out the Reynoldsburg area in June when he opens his Ben's Soft Pretzel Shoppe! Congratulations to Joe Bubonics for choosing to play football and receive his education at The University of Dayton. You are in a recruiting class of 33 members from 10 states including 8 from Ohio. Your class average GPA is 3.61. This is important because for years Dayton footballers have more Honor Roll students than any team in the Pioneer Football League. Last semester there were 79 players on academic honor roll! Good Luck Joe with the Flyer Football team. The UDPriders are looking forward to the son of a Comet coach...can't get much better than that!